Pinon Vista is truly a one of a kind home. No other luxury Santa Fe vacation rental has this much to offer to large parties. It is a magnificent five-bedroom, four-bathroom home ready for you and your party to gather and enjoy our enchanted village. It`s a rare and wonderful thing to find a five-bedroom home, with 360° views of our mountain ranges, in walking distance from the Plaza. Pinon Vista has everything you would need for a vacation with room to sleep up to for 13 people. ( two kings - can be split into singles if you like - two queens, three singles, a queen sleeper sofa, and a single rollaway bed. authentic Santa Fe furnishings, balconies with stunning views, outdoor dining, two full kitchens, even a home gym. We`re confident that this is the best luxury vacation rental Santa Fe has to offer, and it`s only available from Two Casitas. Please note: You must let us know a week prior to arrival if you would like king beds or two single beds in two of the bedrooms upstairs. Pet friendly comment from Miles of "Pet Friendly Santa Fe"
For 20 wonderful years our vacation homes have been offering an authentic way for you to experience this fascinating and historic city. Our exclusive properties, local knowledge and legendary customer service will help you get the very best out of your trip to Santa Fe. 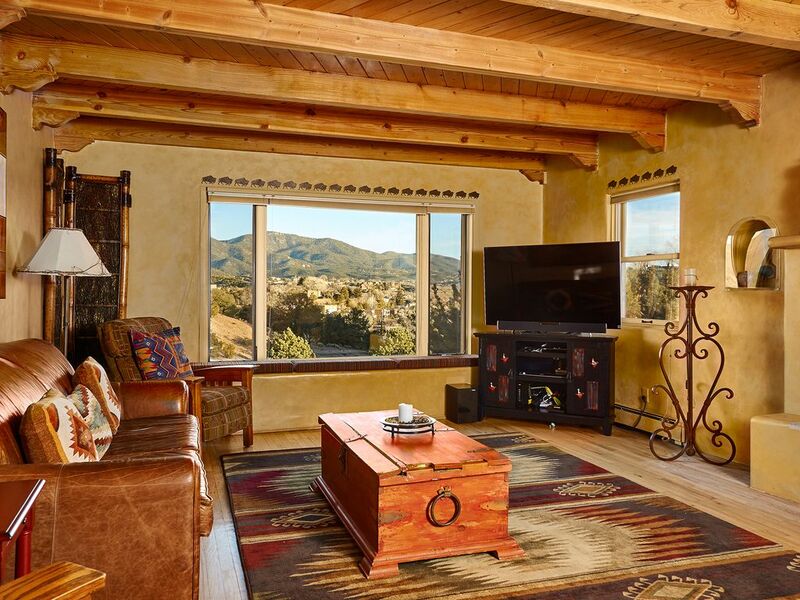 We have a wonderful collection of exclusive Santa Fe vacation rentals, situated in the very best locations, including the down town Plaza area, the Rail Yard and Canyon Road. Many of our luxury vacation homes have spectacular mountain views and are only a stone’s throw from the Historic city center. Whether you want the beauty and heritage of an old adobe home, or you prefer a more contemporary style, we are confident we can help you find the perfect Santa Fe vacation rental. Sleeps 13, easy walk to Plaza and 360˚ views. This is a one of a kind property! When you stay with Two Casitas you stay like a local, not like a tourist, and experience Santa Fe like you live here. Who knows, maybe you will someday! Attached apartment with private entrance; DVD; free WiFi & Ethernnet, free HBO; professional massage table, massage therapist on call; caterers available; personal chefs available, plenty of off-street parking; four cable TVs, two VCRs; one DVD player, 3 fireplaces. World-class skiing is available from Thanksgiving through the first week of April at Santa Fe's Ski Basin high in the Sangre de Cristo Mountains just 16 miles northeast of Santa Fe. Seven lifts, 43 trails, 1650 ft vertical, complete rentals and lessons, children's center and an average of 225 inches of powder per year! Try a round of golf at the Towa Golf Course offering incomparable views of the Sangre de Cristo, Jemez, Sandia and Ortez mountain ranges. This amazing course is part of Hilton's Buffalo Thunder Resort and Casino offering a driving range, large putting green, full pro shop, full food services, rental clubs and spectacular year-round golf. Located just 15 minutes north of historic Santa Fe. Our 30 unique homes are located in Santa Fe's finest neighborhoods, only blocks away from The Plaza, our town’s historic center. Nearby are Canyon Road’s world-class galleries and restaurants; a short walk takes you to the newly modernized Rail Yard historic district. Two Casitas’ vacation homes are tucked away in the city's most tranquil residential streets, yet strategically situated so you can experience our beautiful city on foot. We offer everything from cozy romantic studios perfect for romantic getaways, to one, two and three bedroom homes. Each home is thoughtfully decorated by the individual owners, with emphasis given to historic design themes, local materials and artisans, yet fully equipped with every modern comfort. Step across the threshold of your Two Casitas vacation rental and you’ll know you’re not in Kansas anymore---or New York, or Chicago, or Seattle. Santa Fe's distinctive adobe buildings and architecture evoke the city’s history as a confluence of Spanish and Native American cultures. Two Casitas promises our guests an authentic Southwest experience. Whether you are looking for a century-old adobe home or a contemporary Santa Fe Style home, Two Casitas is sure to have something that will suit your taste. Santa Fe itself offers a unique and enchanting experience rich with breathtaking vistas, award-winning cuisine, phenomenal dining, art, and shopping, excellent museums, and a cultural heritage unlike any other in the United States. in Abique. River raft on the Rio Grande. Take a day trip to Taos. Ride the Santa Fe rail train to Albuquerque or Lamy, NM. Visit Bandelier national park. Visit at least one of Northern New Mexico’s Native American Pueblos. There are many Golf courses and casinos nearby as well. I could go on and on. Experienced travelers know that their choice of lodging defines their journeys. Sustain your Santa Fe memories with Two Casitas.